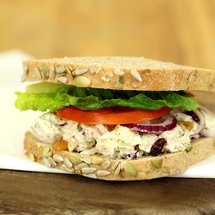 We offer wholesome sandwiches layered with premium, nutritious ingredients. 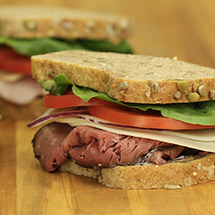 We bake our bread from scratch daily to ensure phenomenal flavor and health benefits, will use high quality meat, gourmet style spreads, and fresh vegetables. 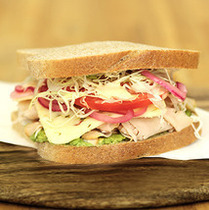 Smoked turkey, avocado, and provolone, with lettuce, tomato, and onions. 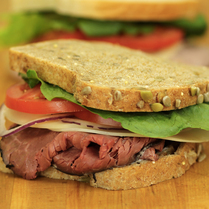 Roast beef and our delicious housemade bleu cheese spread, combined with lettuce, tomato, and onion make this a favorite sandwich! 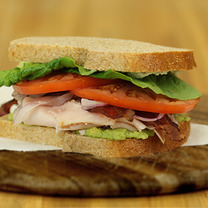 Fresh avocado, sliced turkey breast, and crispy bacon topped with a bleu cheese spread! 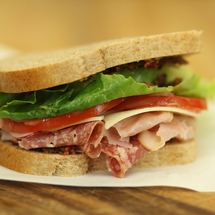 Shaved Genoa salami and smoked ham topped with a roasted red pepper black olive tapenade and provolone cheese drizzled with red wine vinaigrette. 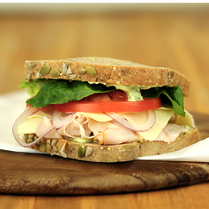 Served on White Bread with lettuce, tomato, onion, and salt & pepper mix. 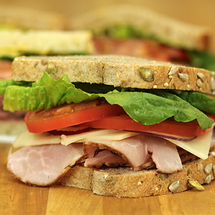 Tender slices of ham, Swiss cheese, lettuce, tomato, onion, spicy brown mustard, and mayonnaise. 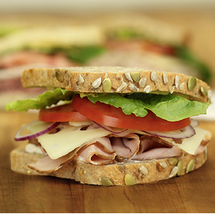 Sliced roast beef, aged Provolone cheese, lettuce, tomato, onion, spicy brown mustard, and mayonnaise. Red bell pepper rings, cucumber slices, cheddar and provolone cheeses, lettuce, tomato, and onion with a housemade sun dried tomato spread.